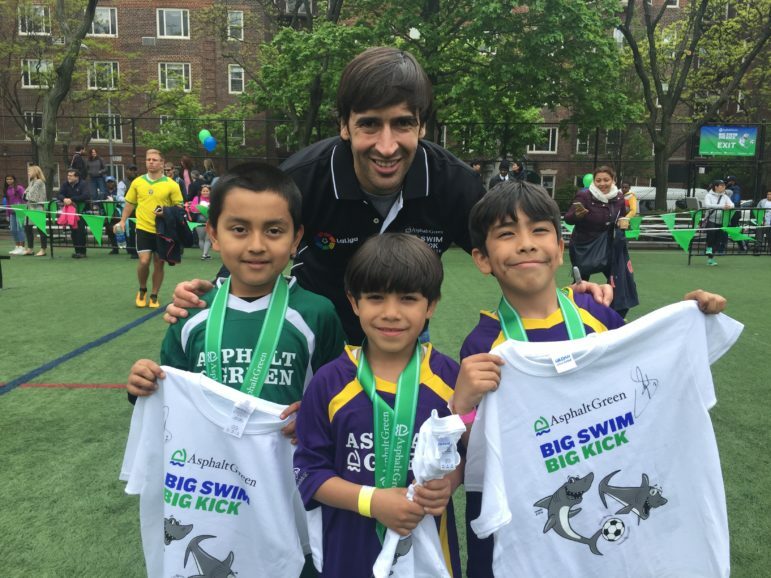 Some Big Kick participants with retired Real Madrid soccer star, Raúl. After 20 years of its annual Big Swim, Asphalt Green held its first-ever Big Swim Big Kick this year, featuring swimming and soccer for over 635 kids ages 6-10. For the Big Swim, kids participated in a 25-yard race in Asphalt Green’s Olympic-sized pool. For the Big Kick, they participated in soccer activities on Asphalt Green’s turf field. The festivities were hosted by three-time Olympic gold-medalist swimmer Rowdy Gaines and Fox 5 reporter Jennifer Lahmers. Big Swim Big Kick’s two featured athletes were former Real Madrid and Spain national soccer team star Raúl González Blanco and four-time Olympic gold-medalist swimmer Jason Lezak. Raúl, who now serves as LaLiga Country Manager USA, played soccer with the Big Kick participants. Lezak joined a group of other Olympians and elite athletes who presented medals to all Big Swim finishers. The event’s honoree was Kirsten J. Feldman, a member of Asphalt Green’s Board of Directors for 18 years, currently serving as vice-chair. Passionate about both environment causes and sports for children, Feldman was Asphalt Green’s biggest advocate in its successful efforts with New York City to move the East 91st Street Marine Transfer Station (MTS) ramp from 91st Street to 92nd Street. As a result, children at Asphalt Green will be kept safe through cleaner garbage trucks, improved traffic patterns, and stricter measurements of air quality. Big Swim Big Kick featured a benefit luncheon to support Asphalt Green’s scholarships and Community Programs. One such program, Waterproofing, provides free water safety and swim instruction to public school students. Children who learned to swim through Waterproofing were among those who completed the Big Swim. Another Asphalt Green Community Program, Community Sports Leagues, provides team sports to 750 public middle school students and free soccer clinics to 220 kids in the Bronx – many of whom participated in the Big Kick. New York State Assembly Member Rebecca Seawright, Manhattan Borough President Gale Brewer, and City Council Member Ben Kallos attended Big Swim Big Kick to show their support for Asphalt Green and cheer on the swimmers and soccer players. Big Swim Big Kick’s corporate sponsors include Fried Frank, Glenwood, PepsiCo, Bloomberg, Skadden, LaLiga, Bloomberg Philanthropies, TYR, Morgan Stanley, Omni New York LLC, PricewaterhouseCoopers, Hospital for Special Surgery, Citizen360, Elite Service Group, Paul Hastings, Sakura Lifesave Associates, Inc., Skanska and USA Swimming. This summer, Flushing Town Hall is presenting a fun and dynamic lineup of performances and special events, providing global arts for a global community in Queens and beyond. This July through early September, the venue will offer programs for a multigenerational audience, featuring everything from drumming under the moon and The Moth StorySLAM to family programming and an adult puppet show.